From the developer that brought you the award-winning original game Boost 2, comes another adrenaline rushing experience: K A Y O S. More intense, more challenging, and more chaotic than ever before. With simple controls and a clean, visually enticing interface, Kayos will immerse you into a world with no boundaries or rules - but do you have what it takes to survive? Thank you for playing - your purchase helps support an independent developer continue to create fun, original games! This should be very good, looking forward to picking this one up! Thanks Pete! I've started a promo code thread over here for those interested. This is my second self-published game ever released, so I'm super excited to hear your comments! I hope you guys enjoy the game. 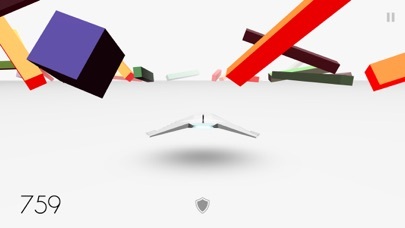 Bought sight unseen based on the developer, alone (and the lack of IAPs). Beautiful visuals. The speed. Rocking soundtrack. The speed. GC leaderboards. The speed. Addictive one-tap replay gameplay. The speed. Even the only part i didnt like (at first) didnt bother me anymore because of how responsive it is. The controls are tilt-only which i normally hate at first contact. I actually hated it when i figured out it was tilt-only. Then i played a second game. And a third. And a few minutes later i forgot it was tilt-only, and i was going past 500 consistently. Admittedly, this is tilt-well-done. The visuals are just so good. 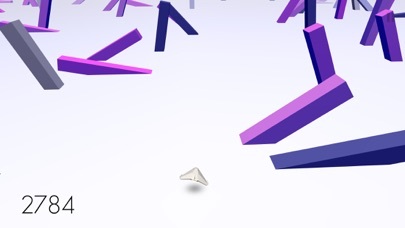 Simple use of 3D geometric shapes obstruct your path. 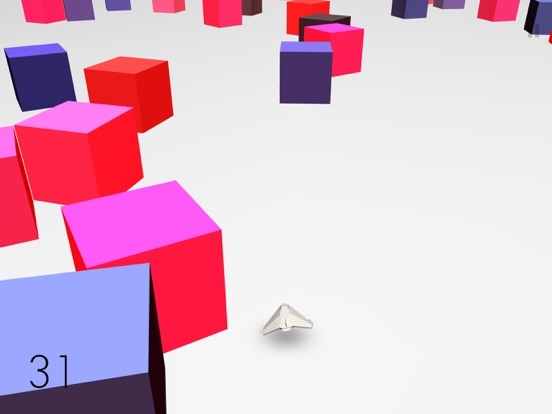 From the simplest shapes just laying there, to cubes that "roll" towards you, or rectangles that topple over you, or even moving obstacles that hit and affect the positioning of other obstalces, this game's visuals are sublime. There's a boost mechanic in which you tap and hold anywhere on the screen, you move faster. Letting go of the boost slows you down. As you boost, there is a boost meter at the bottom that slowly fills up. Letting go of the boost drains the meter. 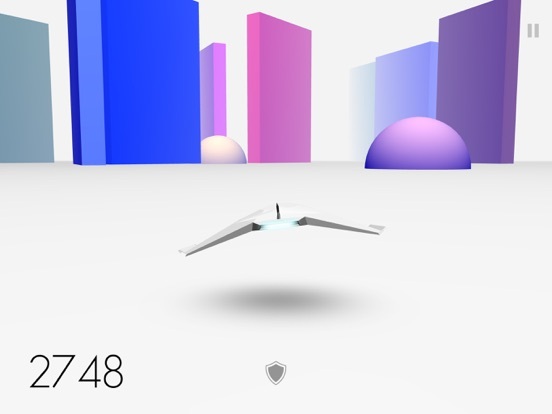 Once you reach full-boost, you gain 1 shield that lasts until you hit an obstacle, and the shield is consumed and you get to continue your run. If im not clear on this yet, I LOVE THE SPEED. It's in the f***-*** level of brutal, yet completely playable. For a buck, you get the whole game, with no crappy ads or IAP. Easily belongs up there with the likes of Super Hexagon and Impossible Road. Definitely lives up to its title... It's chaos. First off, thank you to Jonathon for the code. That said, I agree with everything Exact-Pscience wrote. Im not a tilt fan either, but this game is SO SMOOTH you don't even realize you are tilting the device. As soon as I can I will download this on my phone, because the tilt games I do play I like a lot better on my phone. The colors are great, the speed is great, and unlike other games, I can actually beat my high score. Great game! Oddly relaxing and challenging at the same time. The stark white back ground with the colorful obstacles fool you into feeling all zen and then BAM! Damn falling blocks! 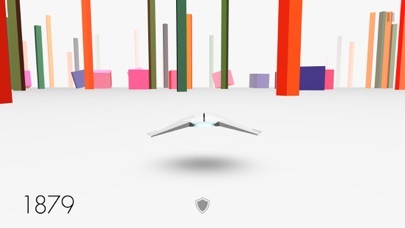 The controls are simple, making the game easy to pick up immediately. 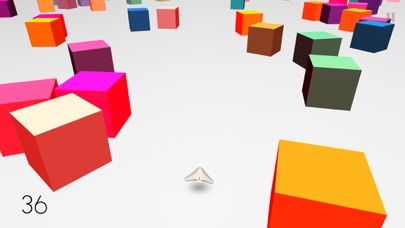 Tap to accelerate, tilt to avoid obstacles. Hold and tap to boost. As you continuously hold and tap, you begin to activate a shield. The one caveat to doing this is you're going so fast you're likely to hit something before activating the shield. Makes it all the more fun. I love it! I imagined flying a starfighter in Star Wars. The music is fantastic and the gameplay is seamless. This will have a permanent spot on my phone. Thank you for the opportunity to play this great game! Now that I've downloaded this game, I foresee this not being a very productive workday! Purchased immediately based on the developer - no IAPs, single purchase this is how it should be done. Butter smooth gameplay, great soundtrack and did someone mention FAST?! 5-star review left on AppStore already, great job! this game is amazing. The art style has that really clean and simplistic look while being really high quality rendering. The music is great too as the rhythm of the beats really in sync with the momentum of you dashing through the obstacles. Also love the fact that you are being thrown into different kinds of blocks to avoid as to run further and further much like a stage / phrase change which eventually get more and more crazy. Best of all I love the sensation of the SPEED in this game. You feel like you are probably driving at 600mph especially when you are boosting your way through. The adrenaline rush of your heart beat while going though this. Really Speedily Amazing! Really loving this. 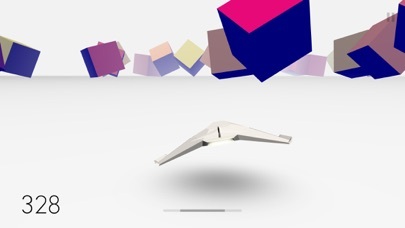 The stark white and bright colors gives it a very futuristic Mirror's Edge-type feel. The sense of speed is fantastic and is a real rush especially when you're using the boost. I'm hesitant about tilt controls but Kayos has it nailed - it felt just right and I feel like it's not the controls but me causing a crash when I fail at the end of a run by clipping the side of something. Very, very fun. Regular price is a deal for the fun I've had this far and the intro price is a steal. This is a five star game! I love the speed and the smooth controls. Also no IAP and no ads. You can't beat the price. Thank you dev for a great time! I am having trouble getting used to the controls. Tilt usually doesn't work well on a full size iPad. It feels too sensitive but at the same time not sensitive enough to correct the over-steering. I wish there was some way to customize the controls. If not virtual buttons at least a way to adjust the sensitivity. Other than that seems like a fun, simple game. Hmm, I could consider putting in some steering buttons for the iPad version...although that would make things complicated for the boost. So that's a tricky one. To everyone else: Thank you for all the warm comments and support! I really do appreciate it - you're an awesome bunch! Just want to let you guys know that I do read everyone's feedback even if I don't always respond individually. The soft pastel colors are comforting while the game itself is chaotic goodness. 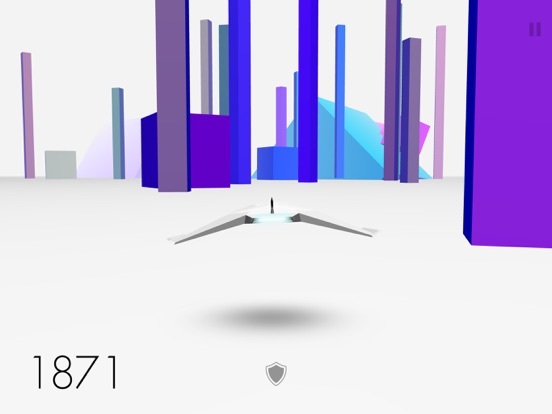 You must operate a jet and avoid all the geometric shaped obstacles. 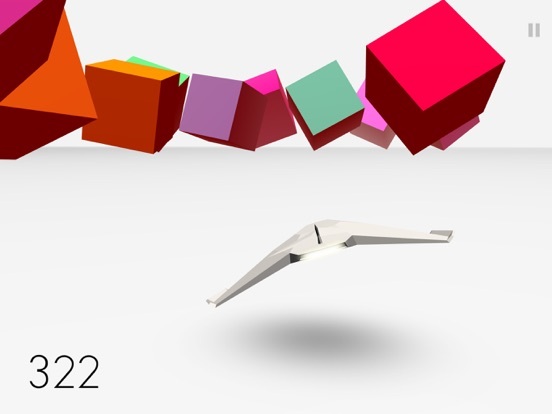 A tilt style high score chaser with the option of going crazy fast by simply keeping your finger on the screen. And; ( if you can handle it.....) If you keep your finger on the screen long enough, you earn a shield that lasts only once. Kayos looks simple, but I assure you, that it is not. Fantastic game for superheroes, savants, and anyone else who loves minimalistic speedy challenges. Edit: works fine on my iPad Air. Would love touch steering only b/c I like it better although the tilt works great. As others have said - this is a tilt game that non-tilt gamers will enjoy. Like Tilt-to-live this game does tilt right (for us tilt haters). Im an older gamer so i dont have the twitch reflexes likely necessary to get the really high scores, but the design, the changing background and the smooth controls make this an easy recommend. Like Boost 2 this is designed really well and any endless runner fan should enjoy it immensely. Still love Boost 2 and now have been waiting years for the next game. Kayos is beautifully done and a lot of fun. We need touch steering control.. Thanks for the response. You may want to check out Skyriders for a way to do steering with a second button. It provides several control options. I play it on an iPad and find it easy to control with the virtual buttons.